The second edition of Think Tank Gallery’s “Cat Art Show” is about to open its doors for a new exhibit in Los Angeles. The show aims to do exactly what it sounds like: present art concerning or including cats, who are enjoying the same status as cult favorite that they always have, because that’s how cats are. The lineup for the show boasts 70 artists, including commercial cat photographer Walter Chandoha and tattoo artist Kat Von D.
The furry exhibition opened March 24th and runs Friday, Saturday, and Sunday from 11 AM to 5 PM at Think Tank Gallery on Maple Avenue. All proceeds will go to Kitten Rescue, an organization dedicated to placing abandoned and unwanted kittens with safe and indoor-only homes. The exhibition will include a huge black and white limited-edition print by Rich Hardcastle, made in collaboration with Ricky Gervais. 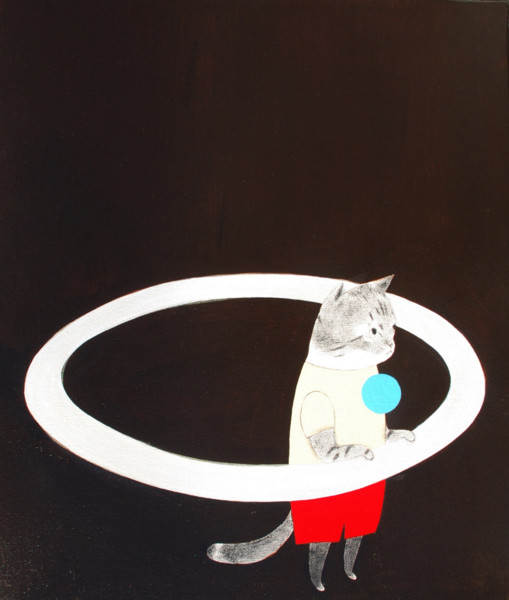 The piece, called “Routine Mischief,” features Gervais in a fuzzy cat costume. Who wouldn’t want that hanging in the walls of their home? Another inclusion, by Los Angeles artist Mark Ryden, features actress Amanda Seyfried holding a large cat. Seyfried wished to be rendered immortal by a painting of her “with blood trickling down [her] throat and [her] holding a dead cat.” Ryden was only too happy to make that dream a reality. This particularly excellent work, rightfully titled “Amanda,” was created in his studio and will be available for purchase at the show. One of the most interesting participants in the “Cat Art Show” is Walking Dead star Norman Reedus, who, as it turns out, enjoys painting and taking pictures of cats when he isn’t beating away zombies. There is actually an unexpectedly large market for cat art, which can hardly be considered “niche” art anymore (have you ever been to the internet?). Carl Kahler’s My Wife’s Lovers, an 1891 painting of only 42 of the artist’s 350 cats, sold at Sotheby’s in 2015 for a whopping $826,000.